Take everything out of the box. 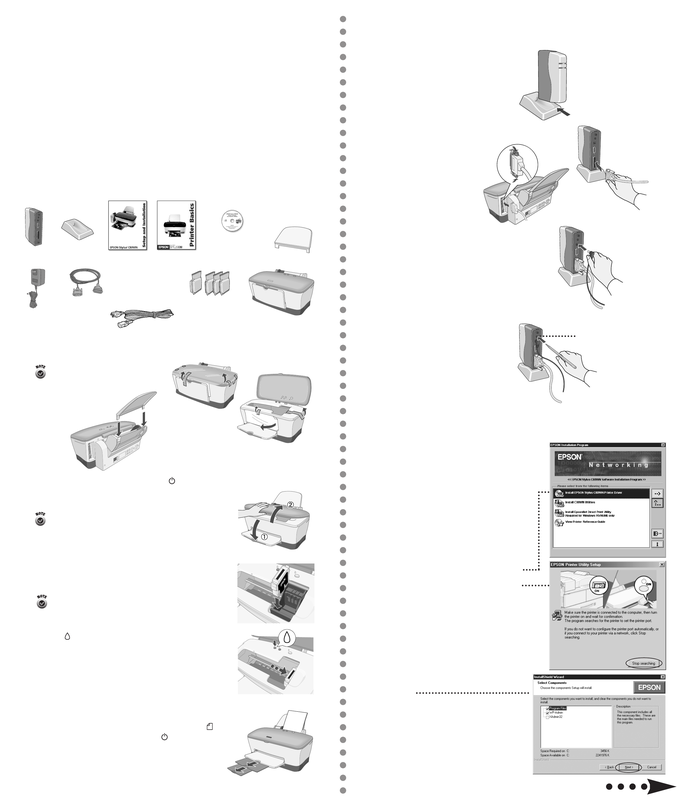 Remove all the tape and packing material from the printer, as shown. Plug in the printer and turn it on. The green power light flashes. Lower the output tray and open the cover. Shake each ink cartridge, then unwrap it. Press the ink button and close the printer cover. Wait while the ink charges. Load paper and pull out the output tray extensions. turn it back on. The test page prints. Slide the print server into the base and press firmly. to the printer and print server. lights come on and then go out. button for one second and release it. see page 41 in Setup and Installation. Keep ink cartridges out of the reach of children. Don’t remove the cartridge labels, or ink may leak. is set to Infrastructure and WEP encryption is disabled. instructions, see page 52 in Setup and Installation. Driver and follow the instructions on the screen. When you see this window, click Stop searching. When you see this window, click Next.